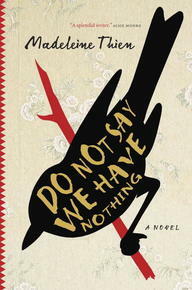 Last month, Canadian Madeleine Thien was among 13 writers shortlisted for this year’s Man Booker Prize for fiction for her extraordinary new novel, Do Not Say We Have Nothing. Shortly after, she won the 2016 Governor General's Award for Fiction and now, she is the 2016 Giller Prize winner. Madeleine is my guest on The Chat. Trevor Corkum: How was the idea for Do Not Say We Have Nothing born? Was there a particular inciting incident—an event, a dream, a snippet of conversation? A piece of art or music? 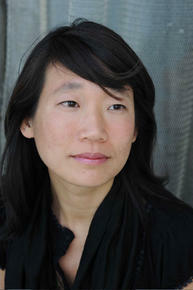 Madeleine Thien: I think it was born in May and June 1989. The Tiananmen demonstrations were the first time that I experienced a historical and political event in real time, because this was the advent of 24-hour news. I was 14 turning 15 years old, and had this intense disjuncture, that I could understand what I was seeing as it unfolded, but there was pre- and a post-, a universe of moments that were hidden from me. It felt as if I were seeing something and being blinded by something in the exact same moment. That profound uneasiness stayed with me for more than two decades, and is the seed of the novel. TC: The novel is extraordinary in scope, covering key historical periods in twentieth-century China, such as the Cultural Revolution and the massacre at Tiananmen Square. Can you talk more about how you approached researching the novel? How important was it for you to describe these events with precise historical accuracy, and how much liberty did you take with historical events? MT: You’re completely right, it’s a vast canvas, but in my mind I was writing about a single lifetime. One could say that the beginning and end of Do Not Say are the life and death of Sparrow, the composer who, for me, is the soul and conscience of the novel. To put it another way, historical events coincide with Sparrow’s life: the time and place into which he was born, and from which he cannot be extricated. Because the historical record has been so manipulated by the Chinese government, historical accuracy is of immense importance to me. The major political campaigns—Land Reform, Great Leap Forward, Anti-rightist, Hundred Flowers, Cultural Revolution—touched every Chinese life. I didn't take any liberties. It’s such a fascinating and profound question, the idea of taking liberty from history. I think every writer who thinks about China struggles with this lack of liberty, especially mainland Chinese writers who often turn to indirection and allegory and docu-fiction. They become, like Russian writers, masters of sleight of hand. I am not a Chinese citizen and so I made full use of the freedom that I had, to write directly, head on, to name the things that should be named, and to do this with all the art, creativity, song, imagination, and intellect that I could muster. In twentieth-century China, history and politics were a force. To write otherwise would be to pretend there’s no wind in the middle of a hurricane. TC: One of the central themes of the novel is the act of witnessing, of remembering. The Book of Records, for example, serves as a living document that continually re-inscribes history onto the present, and allows the contemporary moment to bleed back into history. In what ways do you feel it is important for writers (and readers) to bear witness and engage with the past? MT: This is a question I find difficult to answer, mostly because, as a writer and person, I shy away from what a person should or shouldn’t do or be. I wish for a world in which we each value and make use of our freedom. For me, being alive is being part of this contemporary moment, which is the sum of all moments that led to now. I wouldn’t know how to be alive without thinking about history, personal and societal. It would be like standing on Everest and looking at the glorious sky, but forgetting entirely about Everest beneath your feet. I wish for a world in which we each value and make use of our freedom. For me, being alive is being part of this contemporary moment, which is the sum of all moments that led to now. TC: Music plays a critical role in the novel, as an unspoken, vibrantly defiant language that speaks (and sometimes conceals) the intricacies of grief, joy, freedom, hope—and in its purest incarnation, remains stubbornly outside the control of the state. Many of the key figures in the book are musicians and composers, or rely on music to provide spiritual sustenance in their day-to-day lives. What role does music play in your own creative process and relationship to the world? How can music connect us when language fails? MT: Yes, a thousand time yes to the way you describe music in the novel. Music’s ability to hold a vast spectrum of emotional, intellectual, and physical response is mind-blowing. And, even more mysteriously, it evokes our responses but never contains them, never allows our responses to be stagnant or complete. We never hear a piece of music exactly the same way twice. For me, music comes closest to an approximation of the universe. Writing about music was an immense challenge, but it brought me real joy. I tried to safeguard this joy for the characters, or more accurately, I began to see how desperately they needed to safeguard it—even when it was not possible. For me, music comes closest to an approximation of the universe. TC: Finally, the novel ends with a brief section called “Coda,” in which the narrator, Jiang (Marie) Li-ling, reflects on the role of storytelling (and the storyteller). She says “No one person can tell a story this large, and there are, of course, missing chapters in my own Book of Records.” We are left with one of the central paradoxes of life: that even as we unravel certain truths in our personal narratives, we are confronted with deeper, more complex, often unknowable mysteries. In what ways do you consider this contradiction between revelation and mystery in your practice as a writer? MT: This is the soul of it, I think. Narrative demands a level of satisfaction or closure, which is contrary to lived experience. I think it’s possible that a novel can feel complete even as it feels unfinished, or ongoing. And I think this is true of our personal relationships, our family, friends and lovers. We can feel we know them to the core, we know some essence of them, and yet we can’t know everything, in life or in death. If this is true of others, then it’s true of ourselves. I think I know who I am, but there is some part of me that is mysterious to my own mind and always will be. I want to write fiction that is faithful to this paradox of the human condition. My father has a handsome, ageless face; he is a kind but melancholy man. He wears glasses that have no frames and the lenses give the impression of hovering just before him, the thinnest of curtains. His eyes, dark brown, are guarded and unsure; he is only 39 years old. My father’s name was Jiang Kai and he was born in a small village outside of Changsha. Later on, when I learned my father had been a renowned concert pianist in China, I thought of the way his fingers tapped the kitchen table, how they pattered across countertops and along my mother's soft arms all the way to her fingertips, driving her crazy and me into fits of glee. He gave me my Chinese name, Jiang Li-ling, and my English one, Marie Jiang. When he died, I was only a child, and the few memories I possessed, however fractional, however inaccurate, were all I had of him. I’ve never let them go. Excerpted from Do Not Say We Have Nothing by Madeleine Thien. Copyright © 2016 Madeleine Thien. Published by Alfred A. Knopf Canada, a division of Penguin Random House Canada Limited. Reproduced by arrangement with the publisher. All rights reserved. Madeleine Thien is the author of the short story collection Simple Recipes, which was a finalist for the Commonwealth Writers’ Prize, a Kiriyama Pacific Prize Notable Book, and won the BC Book Prize for Fiction; the novel Certainty, which won the Amazon.ca First Novel Award; and the novel Dogs at the Perimeter, which was shortlisted for Berlin’s 2014 International Literature Award and won the Frankfurt Book Fair’s 2015 Liberaturpreis. Her novels and stories have been translated into twenty-five languages, and her essays have appeared in Granta, The Guardian, The Financial Times, Five Dials, Brick, and Al Jazeera. Her story “The Wedding Cake” was shortlisted for the prestigious 2015 Sunday Times EFG Short Story Award. The daughter of Malaysian-Chinese immigrants to Canada, she lives in Montreal.